In its 10th year of operation, WholeTrees is happy to share that we have received our B Corp Certification. We often discuss our commitment to preserving forests and the ecological world, but our force for good extends much further than the woods. William McDonough, of the cradle-to-cradle movement, explains to truly make an impact with holistic design you must address three aspects and their relations to one another: ecology, economy and equity. The WholeTrees philosophy inherently considers each point of the triangle and we are proud to display our values through a B Corp Certification. "Certified B Corporations redefine success in business." B Corp is a growing movement of owners utilizing their business as a force for good. Consumers are increasingly considering the impacts of their purchases as our economy globalizes. This is evidenced by the growing trend of Corporate Social Responsibility in the building products sector to complement sustainability efforts reporting. Choosing goods and services from a Certified B Corp verifies that the company meets the highest standards of social and environmental performance, transparency and accountability. 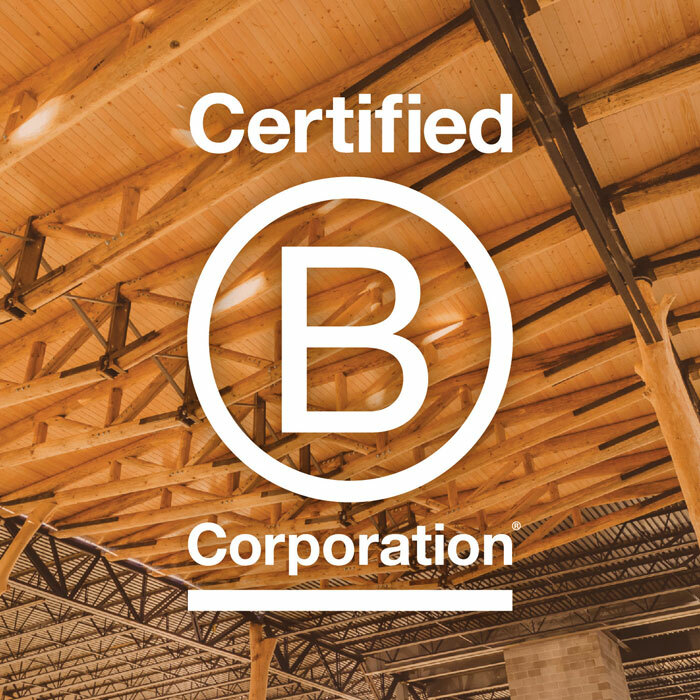 B Corp certification is to business what LBC and LEED certifications are to buildings. We are proud to be a part of this movement and support these values. The wood products manufacturing industry has historically been plagued by companies that exploit resources and workers. In 1971, John Prine sang that “they stripped all the timbers and tortured the land.” His words spoke true to many at the time who saw the negative change timber and coal companies could create in such a short time. Timber companies have clear-cut vast forest lands and left them as quickly as they came, barren and depleted. The exploitation of these forest lands did not just affect the ecology. When a timber company would come in for harvest they provided an economic boom for the locals, but with their unsustainable practices the resources and jobs rapidly disappeared leaving the local economies in the dust. The remnants of many of these clear-cutting operations are still seen and felt in Northern Wisconsin today. These companies have given timber products a bad rap, but WholeTrees and other thought-leaders of the growing sustainable forestry initiative aim to change that. "B Corps aspire to use the power of markets to solve social and environmental problems." At WholeTrees our mission is to build prosperous relationships with forests and communities. The WholeTrees Restorative Model adds economic incentive to implementing sustainable forest management plans. Our timbers are a byproduct of sustainable forest management, which is a main pillar of the WholeTrees philosophy. Forest thinning allows the woodland as a whole to thrive, catalyzing growth and biodiversity. Our approach allows local economies to prosper from the presence of continued regional harvesting providing larger economic returns. Rural communities see a rise in returning shop fabrication jobs that complement their local resources and last. WholeTrees invests in restoring regional forests, uplifting its talented workers and providing accessible regenerative products to the building industry.